Every four years, over 17 days, the Winter Olympics captures our attention as thousands of hours of programming plays on broadcast and cable channels around the world. This year, South Korea is hosting the XXIII Olympic Winter Games, its first-ever Winter Olympics, with 92 countries participating — 2,952 athletes in 15 sports competing in 102 events. But it is North Korea, not Pyeongchang that has dominated the news cycle. North Korean leader Kim Jong Un sent 22 athletes, artistic performers and dignitaries, including his only sister, Kim Yo Jong to the Olympics. She delivered a message of reconciliation and an unexpected invitation to the South Korean president, Moon Jae-in, to visit Pyongyang, the North Korean capital. In the opening ceremony, North and South Korea delegations marched together under one flag. However, 73 years after they were separated, North and South remain deeply divided. Olympic headlines and social media posts ignore the brutality of the North Korean regime and the harsh realities of living under an oppressive communist dictatorship. Yeonmi Park, a human rights activist who fled North Korea when she was 13 years old, has said, "We need to focus less on the regime, and more on the people who are being forgotten." 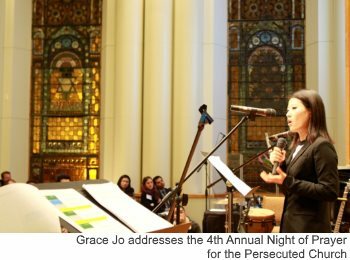 Grace Jo grew up in North Korea with her mother, father, maternal grandmother, and five siblings. Her father died while being transferred to a prison camp; her grandmother, older brother, and youngest brother died of starvation. Her older sister disappeared attempting to cross into China. Jo’s mother decided to flee with Jo, her sister, and her last surviving brother to China. Her mother couldn’t manage three kids crossing the river, so she left Jo’s brother behind with friends, planning to retrieve him in North Korea days later. Jo’s mom could not make it back in time, and her family found out that Jo’s brother had also died. Jo herself was captured and repatriated to North Korea twice. On her third attempt, with the help of a Korean-American pastor, her mom and older sister came to the United States in 2008. She is now vice-president of the North Korean Refugees in the United States, a nonprofit organization. Olympic headlines and social media posts ignore the brutality of the North Korean regime and the harsh realities of living under an oppressive communist dictatorship. The Olympics coincides with the beginning of Lent. It is hard to believe that North Korea had a revival in 1907 that spawned one of Asia’s strongholds of protestant Christianity. For the next three decades more than 3,000 churches sprang up and Christian seminaries and colleges trained Korean leaders. The Christian community, however, relied on Western missionaries who left with the onset of World War II. After the war, the peninsula split into South Korea with Western influence and North Korea with Soviet communist influence. The communist north became officially atheist and has persecuted Christians ever since. Pray that God will bring a change of heart for leaders and religious freedom once again to North Korea. Watch a short video of North Korean refugee Grace Jo. Support Free North Korea Radio, established by North Korean defector Kim Seong Min. FNKR has become the most popular single program among North Koreans. Pray for revival and religious freedom in North Korea.